Disclaimer: I was given complimentary admission in exchange for an honest review. All opinions shared are my own. 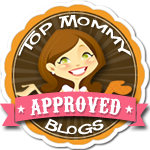 The winters are long in Connecticut and I find it crucial to have a list of indoor activities to keep my little ones engaged. We’ve already exhausted the local library and for some reason my son doesn’t find perusing the aisles of Target nearly as engaging as I do. I knew that we needed to find somewhere new to play and fast because this winter seems to be never ending. 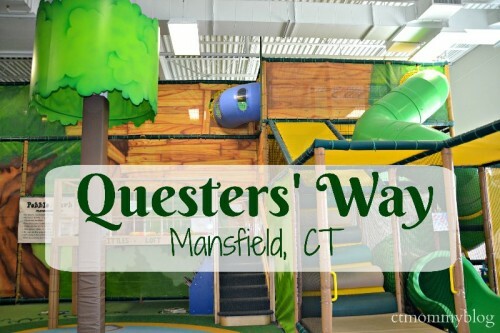 When I heard about Questers’ Way in Mansfield, CT I knew it would be the perfect way to spend a cold and dreary morning. 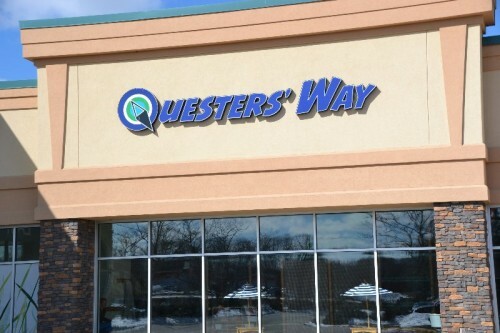 Questers’ Way is located inside of the East Brook Mall around 10 minutes from UCONN. It was founded around two years ago with the hope to enhance the whole person through exercise of mind & body, interpersonal skills, unstructured play, and nutrition. 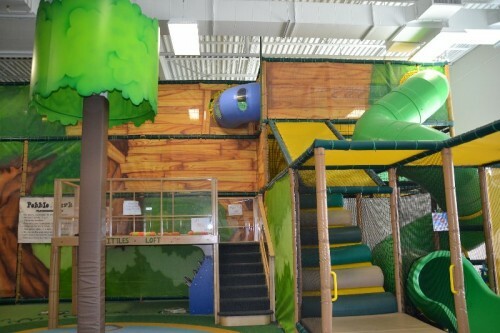 Pebble Park at Questers’ Way is an indoor play space for children 12 years old and under. I was immediately drawn in by the brightly colored murals and multi-level playscape. 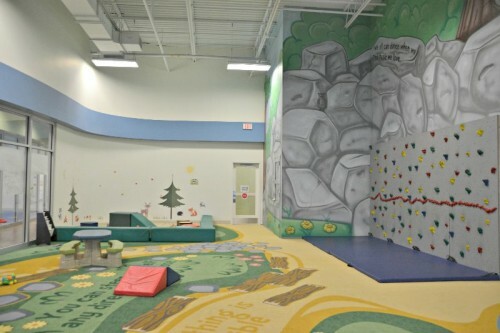 The space is designed with all children in mind from the adventure seekers to the observers. 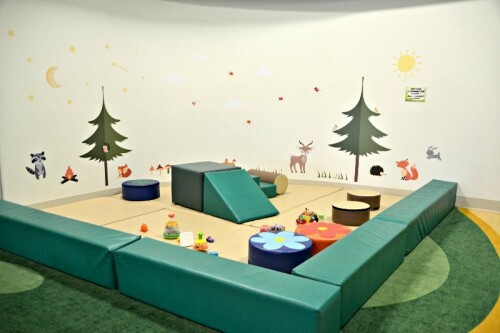 There are plenty of little nooks for children to explore and stay busy during their 2-hours stay. Staff members also come in to engage with the children. While I was there they were playing dress-up, reading books, and playing hide-and-seek. Before anyone can play they must fill-out a waiver. Save time before your visit and fill it out online. Little ones are also told the rules of the area which I thought was helpful, especially during busy times. There are cubbies for personal items and shoes. All children and adults must remove their shoes and wear socks. TIP: Since most indoor play spaces ask you to remove your shoes, I always suggest carrying an extra pair of socks in your diaper bag or car. They always come in handy, especially in the summer when you’re less likely to already be wearing socks. If you’ve watched my InstaStories then you’ve already seen a great view of the Pebble Park layout. My little guy loved exploring the playscape. 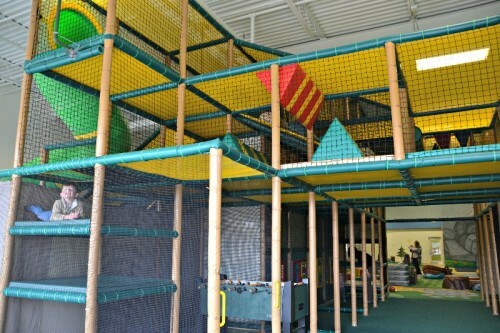 It was like being in a tree house way above the rest of the world with magical slides, tunnels, and climbing structures. I was able to walk around and watch his every move while he squealed above with excitement. 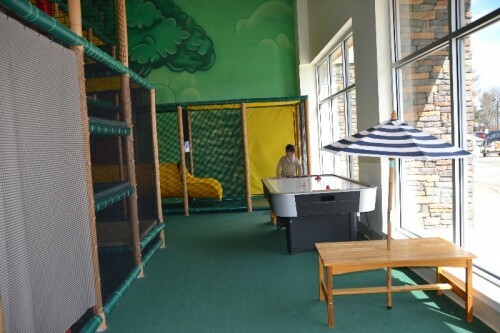 In the center of the room is a small slide and mats for younger children or those looking for a break from the large playscape. 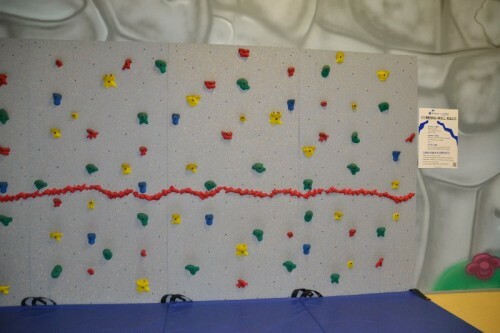 There is also a rock wall for little ones to practice their climbing. On the opposite side of the playscape is a toddler area dedicated for pre-walkers. 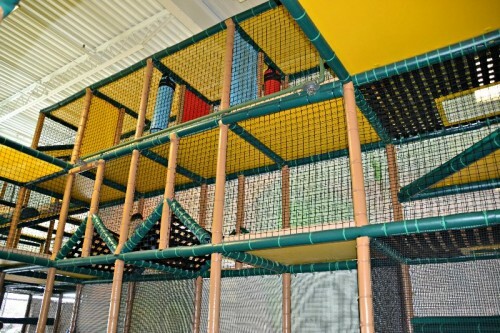 It is set up with soft mats and toys. It’s partitioned off from the rest of the space but still gives clear sight lines for parents to observe their older children playing. There are benches scattered around for parents to observe and for children to take a rest. 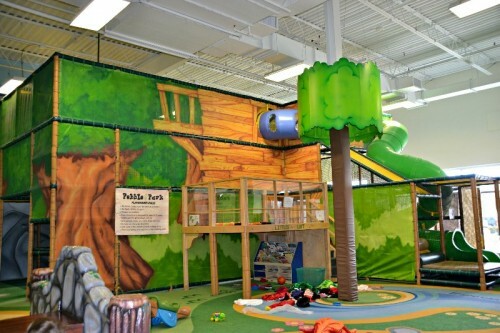 There are also quiet game areas with blocks, books, and dress-up for children to explore. I loved that there were air hockey and Foosball tables so that children and parents could play together. 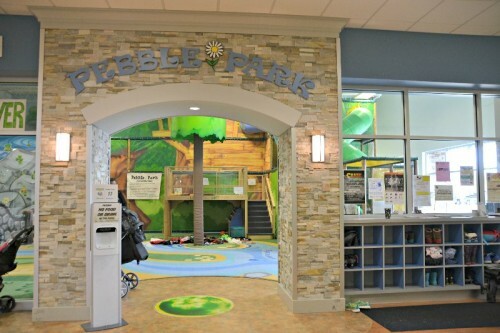 Walking into Questers’ Way you immediately see the amazing indoor play structures at Pebble Park but behind those doors are several additional “neighborhoods” created to target different skills. 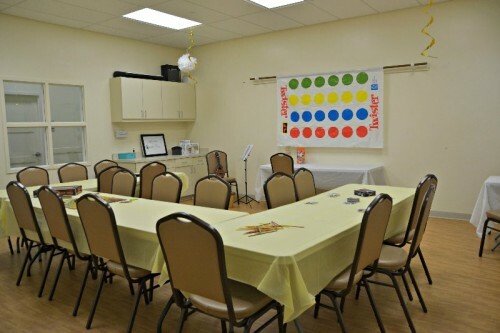 There are opportunities to participate in child and adult enrichment classes, homeschool classes, birthday parties, martial arts, and a café. 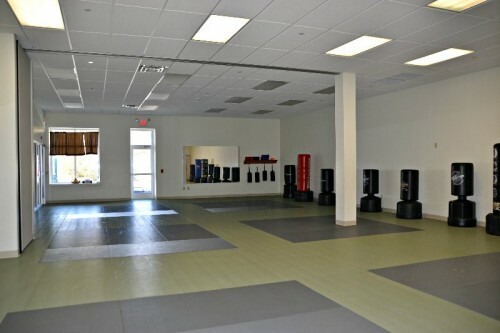 There is a full schedule of classes offered on a drop-in or membership basis. 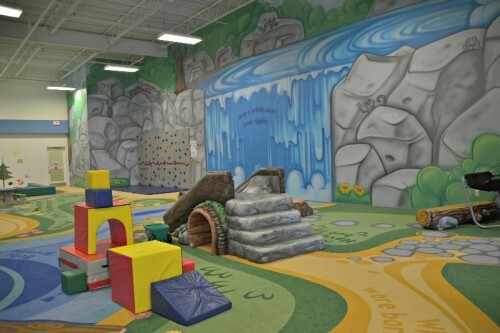 There’s even the option for adults to take classes while their children play at Pebble Park. 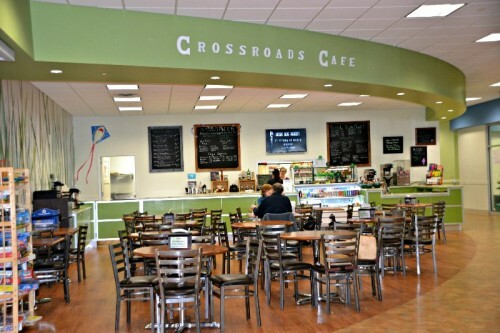 Questers’ Way has an in-house café committed to preparing fresh and healthy food. There is a full made-to-order menu with kid-friendly options available to enjoy a snack or meal during your visit. 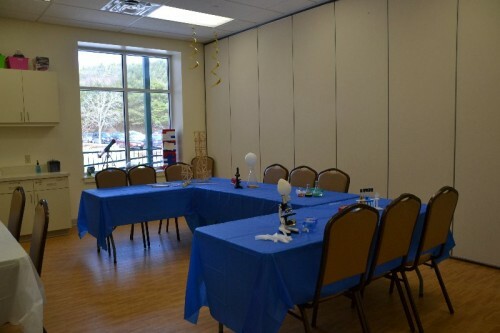 There are tables up against the glass windows so parents can enjoy a peaceful drink or treat while still keeping a watchful eye on their children playing. We enjoyed a fun morning at Questers’ Way followed by a yummy lunch in the café. I loved visiting and learning how all of the “neighborhoods” tied together to enhance the whole person. My little guy had a blast exploring Pebble Park. He said he had a “fantastic” day! I would recommend a visit from any part of Connecticut. It’s truly a unique and engaging space.